A Morse code jean bracelet! Ain't it cool? 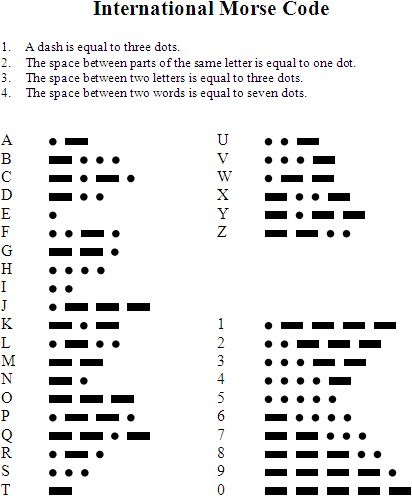 There are lots of Morse code jewels out there, but mostly they use patterns of short-and-long beads. I decided to paint mine instead! Here's the code; see if you can read them. I could tell you how I made them...but then I might have to kill you. Oh, well, if you're willing to risk it, read on for the Top Secret DIY! Ready? Let's begin! Trim the inseam from a pair of used-up jeans. Then snip into sections an inch shorter than your final desired length. To attach, simply squoosh the crimps tight with pliers. Tight, people, I mean it! Use one jump ring to attach the clasp on one end. On the other end, link the rest of the jump rings to make a little chain. (Yay - an adjustable-length bracelet!) Finish with the dangle or charm. Voila, you now have the basic bangle bracelet. And oh my goodness, it is darn cute just as it is! Now to paint in Morse. A tiny brush and any good-quality craft or fabric paint, and you are good to code. Lay out your letters on paper first, then tape the bracelet down so it will stay put. Add your color with a tiny brush. Two alternating colors is a fun way to separate the letters, but if you have room, you could use one color and a larger space between each letter. Notice how light it is on the first coat. The fabric will absorb most of the paint. Let that dry a few minutes, then go back for a second coat - the colors will suddenly pop! Finally, outline in a black fabric paint pen. A Sharpie works, too. To protect the code, two choices. 1. Apply a light coat of clear sealer (such as a spray-on poly or fabric Mod Podge). 2. Use an iron to heat-set the paint. With this method, be sure to place a piece of fabric between the iron and the bracelet. And there you have it, your Morse Code bracelet is complete! By the way, this jean seam idea is basically a new version of my most popular project ever, the Blue Jean Seam Wrap Bracelet. Anyone been here long enough to remember that one? Now, do tell! What would you write on yours? "i'm in denim" or "time to craft". Cool projects. Thanks for sharing this beautiful bangle/ bracelet :) Love it.. This is awesome Michelle! Yet another use for those jean seams! - I'm going to pin these to make with my girls sometime. I'm sure they would think of endless ideas of what to write and draw on them! All I need to do is find some of those ribbon crimpy things!! Thanks for sharing and as ever for the inspiration! Very, very cute. And I LOVE that these are made with recycled jeans - how fun is THAT???!!! Thanks for such a creative idea; will definitely be making these soon! I love this idea! What a unique take on morse code jewelry. I have to try this one out! Oh yes, I've been around a long time and I remember your fabulous jeans seam bracelets. These little numbers are so darn clever and only you would think of using Morse code. Love it! Coolness. I'm not sure what I would write. ? Maybe my name? Oh this is my favorite project of yours ever! I have a family reunion to go to in July and 5 sisters I wanted to make something for. This would be awesome!! pinning! I'm dead...with smiling face...the cost of making and wearing your super cute jean's bangles! Really cute bracelet. 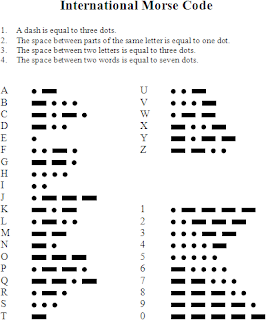 I copied the Morse code chart to use in the future. Thanks. I love the Morse code idea! Very cute! Love the idea! How clever and pretty! I absolutely love this upcycle project. I really think this is the funnest repurposed denim idea that I've seen. Very cute, I can't wait to make some! Thanks, Patricia, I'm so glad you like! Now I wonder what things you will write in Morse code? have fun! You are truely gifted by the Lord to be able to see beauty and create such works of art from trash. I just found your blog and I love your posts already. KEEP them coming. Absolutely love this tutorial! Used it and came up with a great variation! My husband passed away recently. I’m going to take his old jeans that I was having trouble parting wth. Will make a long wrap bracelet and spell out “gone but not forgotten” in Morse code. He was career military so it’s fitting. Thanks for inspiration.